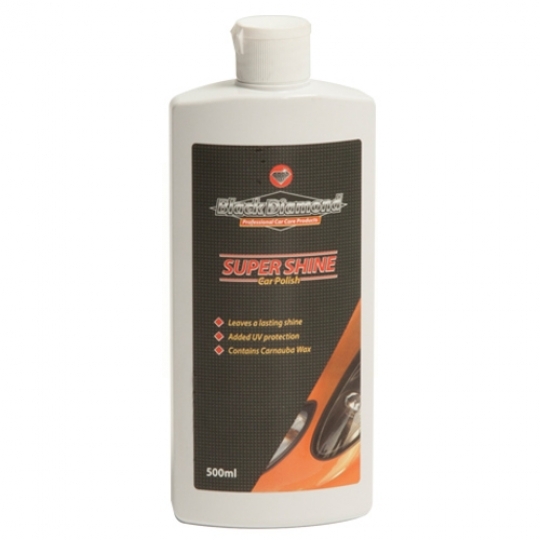 Super Shine is a liquid wax containing a secret blend of waxes and silicones, including pure carnauba wax and top quality synthetic hard waxes. Unlike other manufacturers, we use pure carnauba wax in it's natural form to make Super Shine as opposed to ready made emulsions and additives. This requires a high level of technical expertise but results in a product which out lasts other liquid carnauba waxes. This, coupled with it’s unique UV absorbers means Super Shine gives unbeatable longevity and protection from a liquid wax. Super Shine gives the smoothness, gloss and ease of use of a liquid polish, and the durability and protection of a paste wax. The product is blue in colour and contains a rich, sweet fragrance. Super Shine lifts tired, dull or swirled paintwork without cutting paint, but is also ideal for protecting the finish on new cars. Super Shine is very low dusting and due to our complex wax blend is surprisingly easy to apply and buff for a carnauba based product. To use simply apply sparingly to either the whole vehicle or one panel at a time using a clean cloth, sponge or polish applicator, allow to haze, then buff off with a clean, dry microfibre cloth. Available in 500 ml. Price displayed excludes VAT. Orders to mainland UK only. Goods from 0.1 to 2.0 kg will be despatched using Royal Mail Small Parcel Service (Mainland UK 4 day delivery) and charged accordingly. We also welcome both professionals and home users to visit our Trade Counter in Little Wymondley, Herts., and take advantage of discounted prices on all Accessories.